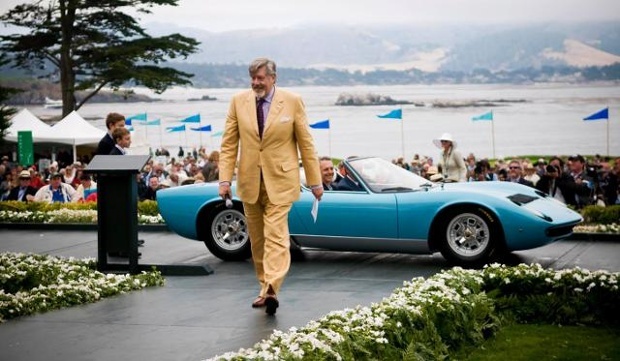 Edward Herrmann had a passion for American classic automobiles and served as Master of Ceremonies for the Pebble Beach Concours d’Elegance. PEBBLE BEACH, CA —Edward Herrmann, the melodious-voiced actor who many on the Central Coast knew as the voice of the Pebble Beach Concours d’Elegance, died on Wednesday. He was 71. Herrmann died at Memorial Sloan Kettering Hospital of brain cancer, his son, Rory Herrmann said. The actor, who had been hospitalized for several weeks, was surrounded by family members including his wife, and his three children, his son said. “He was full of knowledge and kindness and goodness. … He always wanted to share the great and beautiful things in life,” said Rory Herrmann. That included art, music and classic cars. Herrmann also provided the voice for FDR in Ken Burns’ documentary series “The Roosevelts: An Intimate History,” which aired on PBS earlier this year. His urbane tones were heard on a variety of other documentaries and on hundreds of audio books including Laura Hillenbrand’s “Unbroken.” He had recently narrated a documentary on cancer, Rory Herrmann said. He appeared frequently on the big screen, in major films including “Reds” and “The Wolf of Wall Street,” and was an acclaimed stage actor whose Tony-winning performance came in 1976 for “Mrs. Warren’s Profession.” Television was also a familiar home, with recent appearances on “The Good Wife” and “How I Met Your Mother. His best-known role came on the 2000-07 series “Gilmore Girls,” on which he played the patrician father of a single mother (Lauren Graham). Herrmann, a native of Washington, D.C., graduated from Bucknell University and studied his craft on a Fulbright scholarship to the London Academy of Music and Dramatic Art in 1968-69.